In this article, you'll learn how to change the default feedback options on a test. After taking test: Grade, response scores & feedback. After test date: Grade, response scores & feedback, correct answers. In the right column under Information, you'll find the Feedback settings. Click the word Feedback. After taking test: After the student has pressed the Submit button on a test, she'll get the feedback you specify. 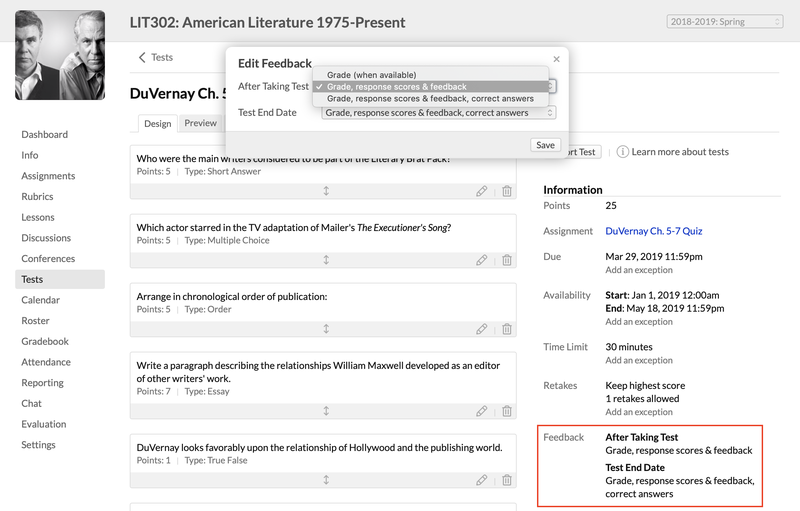 After test date: After the availability window for the test has passed, students will be able to get the feedback you specify by viewing their own test's History view. Grades: The student can see her grade (as soon as it's available). Response scores & feedback: The student can see what she got right (and wrong), together with the points or partial credit for each question, as well as any comments you wrote while grading the test. Correct answers: The student can see the correct answers you entered for question types that can be automatically graded.